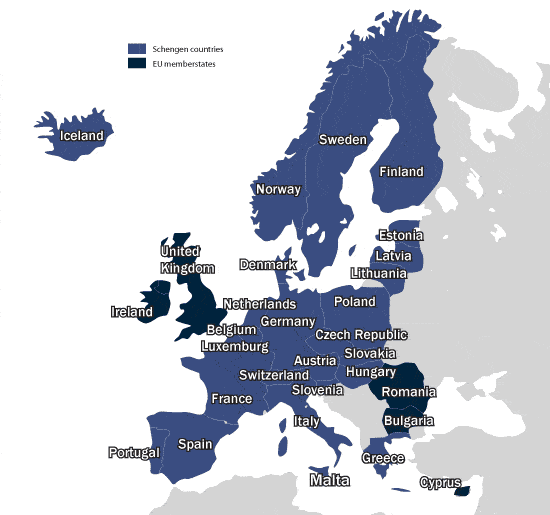 If you wish to apply for a Schengen visa to visit any of the countries within the Schengen area, you must provide photographs as part of your application. If you fail to do this, your application may be rejected. 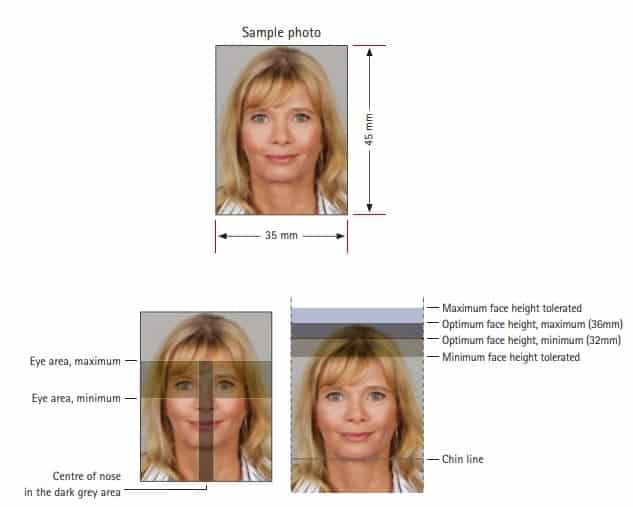 Depending on the consulate you are applying to, you will be asked to provide either 1 or 2 photos, but it’s recommended to have 2 just to be on the safe side. 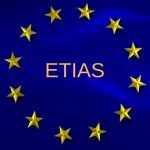 Whether you are applying for a Schengen (short-stay) visa or a National (long-stay) visa you will have to provide photographs that meet specific requirements. Your photographs cannot be older than 6 months. If they are you need to get new ones taken. If you have your photos taken in a booth they are usually the correct size, but if you use a photo-printing service you must ensure they are the correct specifications. Your photos should be passport-sized which is 35 mm x 45 mm (3.5 cm x 4.5 cm or 1.37 in x 1.77 in). Your photographs should also be in color – black and white photographs are unacceptable. 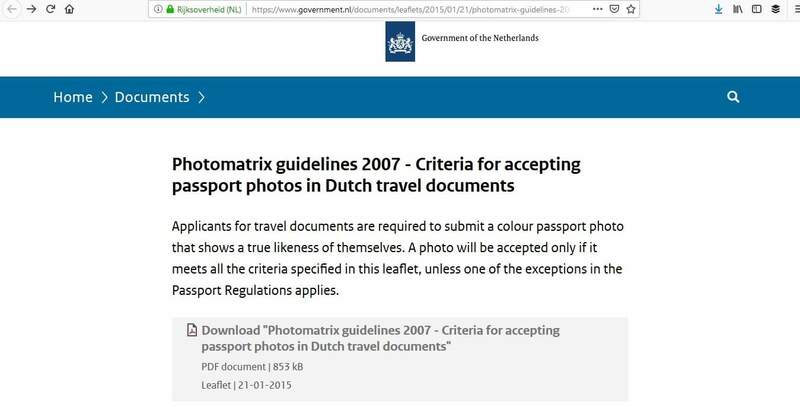 These photographs from the consulate of the Netherlands show a perfectly acceptable color photograph. – Size: 35 by 45 mm (width x height). – Width: from ear to ear, between 16 mm and 20 mm. 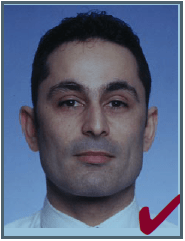 – Height: from age 11: from chin to crown, between 26 and 30 mm. – up to age 11: from chin to crown, between 19 and 30 mm. There must be a close up of your head and top of your shoulders. This means that your head will take up 70% to 80% of the shot. This is to allow for your facial characteristics to be shown clearly. 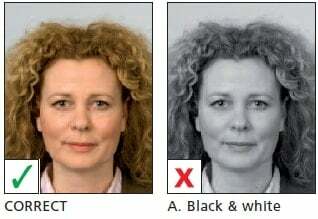 Look at the 4 photographs from the consulate of Germany to get a better idea of what this means. You must be looking straightforward with your eyes open and mouth closed. 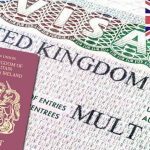 Photographs for visas are different from your portrait photos and they must be able to identify you for entry to another country. Don’t turn your head to either side and don’t look away when the photo is taken. Also, if you have long hair, don’t allow it to cover your face in any way. In addition, you should refrain from smiling as this changes the shape of your face. 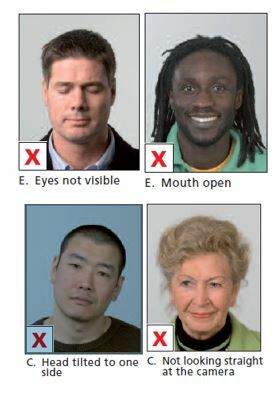 These photos from the Dutch consulate give an idea of the how your head should be positioned and the correct, and incorrect, facial expressions. The quality of your photographs should be excellent. They should be clear and in sharp focus – blurry photos are not suitable. 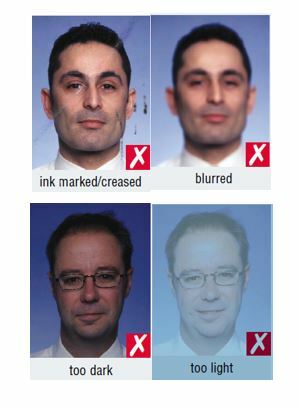 In addition, there should be no marks, such as ink, and the photograph should not be creased. They should also be the correct brightness and contrast – not too pale and not too dark. 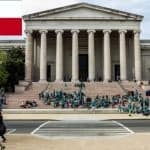 Check out these photographs from the Embassy of France’s website which gives you an idea of what’s acceptable and what is not. Having the correct background for your photograph is equally important. The background should be plain and of a light color – white, blue or grey is usually acceptable. There should not be any patterns or shadows in the background. In addition, don’t wear clothes that match the background of your photo so as to be camouflaged against it. The idea is for the background to provide contrast to your hair and face in order for you to be recognizable to the consulate when you submit your visa application. These examples from the German consulate shows the perfect background. 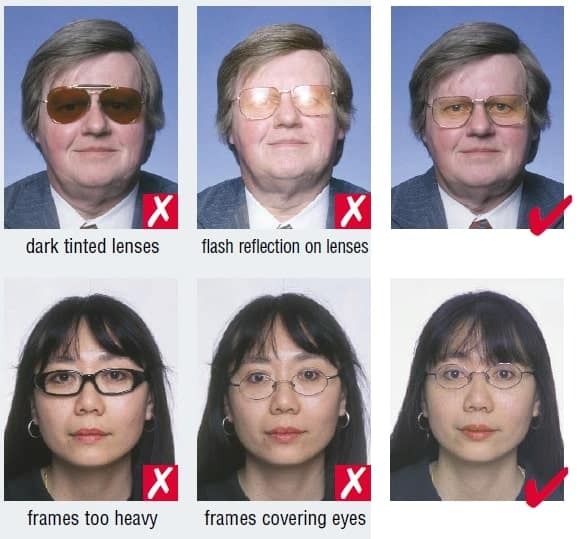 If you wear glasses you don’t have to take them off to have your photo taken, but you must ensure that the frames don’t cover any part of your eyes. Your eyes should be completely visible. You should not wear tinted glasses or sunglasses and there should be no reflection from the flash when the photo is taken. The French consulate has ideal illustrations for you if you wear glasses. It is not permissible to wear any hats of any kind when you have your photo taken. Headcovers are allowed if they are required for your religion, but you must ensure your face is clearly visible from the chin to the forehead. You cannot wear any head covering that creates shadows on your face or where your face is not shown. 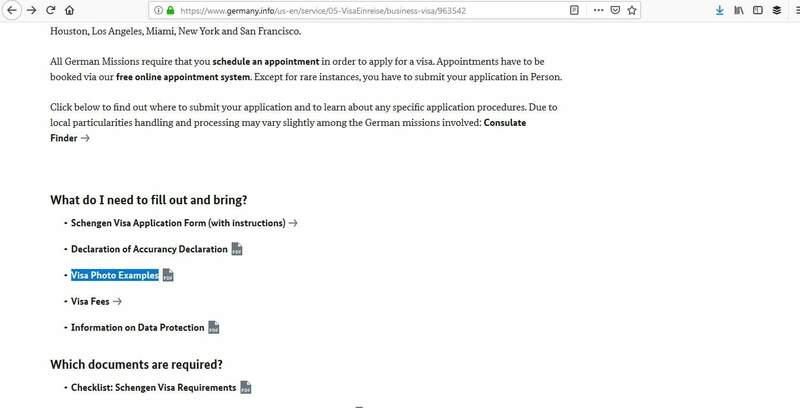 Have a look at the examples provided by the Consulate General of Germany. If you are applying for a Schengen visa for your child, you must also provide photographs which meet certain requirements. The face should be 50%-80% of the photograph. Unless your child is under 5 years of age, their head should be fully facing the camera and have a neutral expression which means no smiling. In addition, there should be no one else in the photo and your child should not hold any objects, like toys, nor should they wear any type of hat. Have a look at the photographs from the German, French, and Dutch consulates to get an idea. Photographs must be glued and not stapled to the application form. 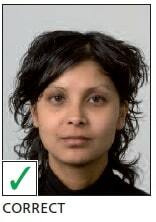 If you have to provide 2 photos, one should be glued and the other kept loose for the visa official. They all have the same requirements and specifications when it comes to the photographs required for your Schengen visa application. Whichever consulate you are applying to for your Schengen visa, you will find specific photo requirements on each of their websites, so it’s recommended that you take the time to look at what they are. It is vitally important that you include photographs with the rest of your Schengen visa application. They must adhere to the above photo requirements and specifications. If they don’t, it will mean that your application could be denied and this could delay things for you. So, it’s advisable to take suitable photographs before you begin the application process. This will save you time when you get down to applying.